Fury Shark seems to have Captain Midnight and Charlotte in her grasp. She wants to make Midnight watch as polar bears rip apart Charlotte. But Midnight breaks out of his bonds, and starts battling Fury's team. He throws one of them into the path of the polar bears, buying Charlotte time. Charlotte tries to stop Fury from escaping, and the two fight, but Fury kicks her out of a moving plane. Captain Midnight glides up and rescues her. Meanwhile, back on the ship, Commander Johnson learns that men died carrying out his plan with Midnight, and starts to come clean, but is shot by a sniper called Helios. After the fights end, Agent Jones and Marshall regroup with Midnight and Charlotte. They explain that as he died Johnson mentioned something about a Mr. Jones and "Black Sky." 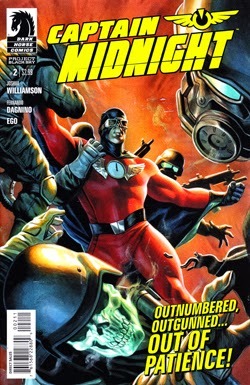 Although Midnight recognizes the name, and it is connected with his time-traveling disappearance, he pretends to know nothing about it. Midnight, Charlotte, and Marshall agree to go after Fury Shark, while Agent Jones returns to his job to work his angle "from the inside." As the story concludes, Helios reports to a wheelchair-bound man who seems to be in control of Midnight's company, Albright Industries. This is a decent story that is marred a bit by some unnecessarily confusing plot elements. Overall, the action scenes were fairly good, and I liked the battle between Fury and Charlotte in particular. Johnson turned out ot be more complicated than I had originally thought. Last issue, he seemed to be a traitor, but this time it turns out that he just did what he thought was right, and that he was acting on orders on top of that. Several of the characters, including Fury and Charlotte, are well-defined. On the other hand, Captain Midnight himself is rather lackluster. We're now three issues into this series, and still don't know much about the title hero. He's a good fighter and does well in combat, and he's a skilled inventor. But as a person, I really don't get a sense of who he is. We do see in this issue that he is keeping some secrets, but we don't know why yet. Here's hoping Midnight's character is explored in more depth in the next story arc. Another problem I'm having with this series is that in addition to his personality, I'm not yet clear on what Captain Midnight's powers are. He has gliding powers, apparently based partly or wholly on his costume, and he seems to be super-strong. What other powers he has have not been clearly demonstrated. I suppose Williamson may feel it is not necessary to demonstrate Cap's powers since is a classic pulp hero, but he needs to throw us new readers a bone. I've never read anything about this character before and I'd like an explanation of how his powers work. This story also had some confusing elements. The most notable of these is the Agent Jones/Mr. Jones problem. Agent Jones is in the current age, helping Midnight. Mr. Jones was around in 1941 and apparently had something to do with Black Sky. Unless Williamson is planning to reveal to us that the two are biologically related, it is confusing to give them the same last name. I wasn't sure who was being talked about in a few panels. Similarly, Commander Johnson has a name that is very close to "Jones." All three characters should have had more distinctive monikers to help the reader follow along. All that said, I think that the overall story was fairly good, and I enjoyed it well enough. The confusing parts, and the elements that bore further explanation, detracted from the story a little bit, but in the end it wasn't bad. The artwork was quite strong, and actually a bit better than the story. I will try issue 4 at least, before deciding whether to put this series on my permanent pull list.